My two oldest are only one year and two weeks apart. I signed the older one up for soccer but the younger one was just a little too young to play. 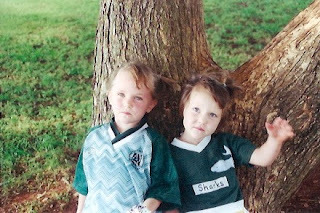 The soccer team named themselves “The Sharks.” They had tiny cleats and enormous soccer socks and basically ran around, made lots of noise and had a great time. The younger one was not happy. She has never been a sit back kind of girl and she was sure this was a horrible injustice. There was a big tree near the edge of the field with a y in the trunk. She would spend most of the time in the tree giving the players the death stare. I was talking to my mom about it and she suggested that I get the younger one a uniform so she would feel a part of things. Great suggestion but the soccer league was of the “take things very seriously” variety and uniforms were not to be had. My mom found a little sport jersey in the right colors. 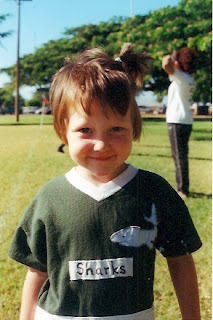 She sewed a fabric shark and a label to the front and we had a soccer mascot. She wasn’t completely appeased and there was an unfortunate incident with the soccer trophy but she spent less time in the tree. Oh I love her! That little face is so her at that age. It's just daring someone to disagree with her!